The piece uses parkour as a metaphor to show how we can overcome everyday problems with our own effort. Movement as a tool to escape everyday life! Set design: scaffold of variable design with the following measures: L.8m x W.10m x H.8m max. 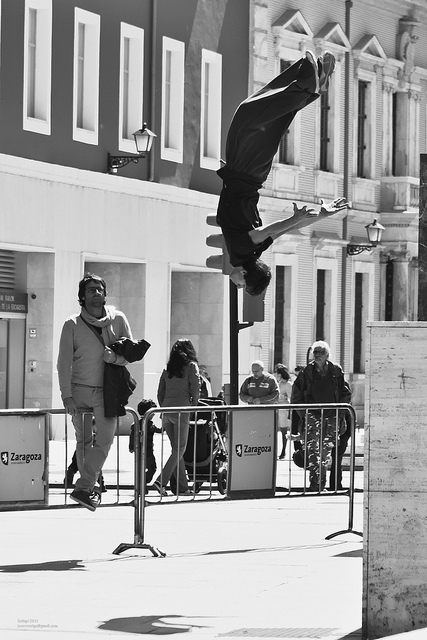 Possibility of giving an initiation workshop to parkour. Number of participants: 15-20 participants per teacher (there are 2 teachers minimum). Length: 2 hours. This is a multimedia art show based on the traditional tale of Red Riding Hood. The public can observe a movie and its making-of simultaneously. 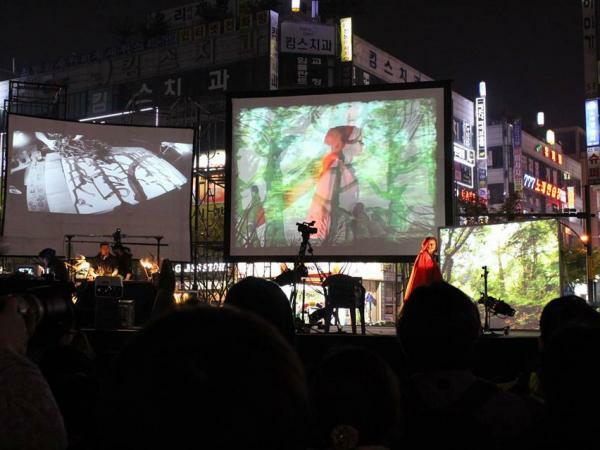 Video, music, painting and theatre interact on the stage. The performance has several versions that can be customized according to the type of public: for children, for adults, outdoors, and indoors. Workshop on the use of new technologies and mixing disciplines in the performing arts. It would include creating a performance. 6 hours long and 10 participants maximum. Mar Gómez’s company story-tells by dancing. In this piece, the story is about the encounter of two strangers; a very strong woman, and a man adrift. But there is another constant character in this story; a washing machine is the third element in the triangle. 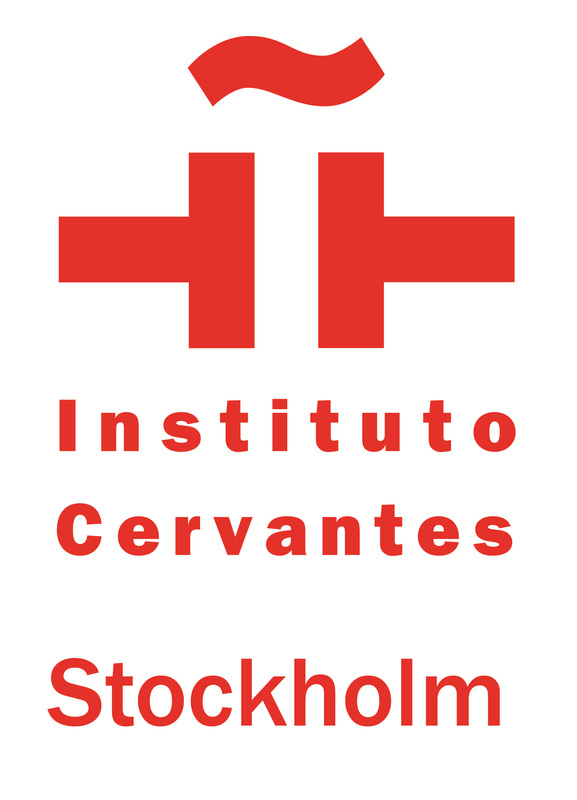 There is the possibility of carrying out the “Playing with dance” workshop. The participants’ age range is 5 to 10 years old. Length: 1h30mins. Flamenco piece dedicated and inspired by the different people we encounter in our lives, who we do not see ever again, and with which we share moments of joy and melancholy without even speaking; quick encounters of people who then go different ways. Possibility to do a workshop for choreographers, dancers, bailaores, and dance students. 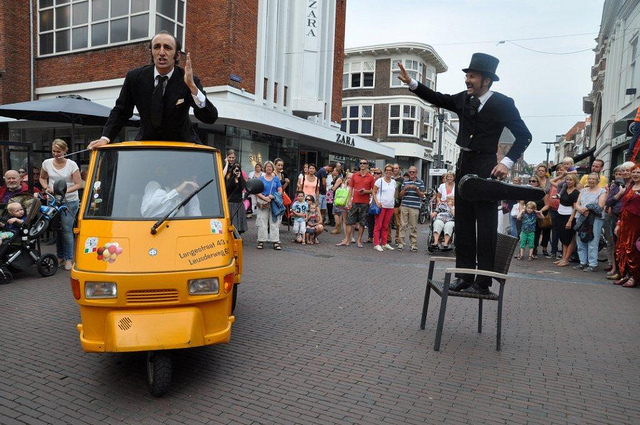 Street theatre show that uses humour as the main tool to connect with the audience. The streets is a stage! An orchestra is lost in the city looking for the theatre where they have been hired to play. The problem is that they are in the wrong city! When they find out, chaos and improvisation turns into a hilarious concert improvised with the audience. The company can give a workshop about street comedy theatre. The maximum number of participants is 18 and anyone can participate. This performance is a statement against architecture that does not shield, as well as a critical and imaginative view of society and the way it inhabits architecture. The main characters are two handymen. They use humour and humanity to make the public reflect upon universal questions. The public is also part of the piece, and can walk around the stage during the performance. Possibility of giving a workshop about new ways of being on stage. It is meant to be given to professional actors and creators. Maximum number of participants: 20. Minimum number of participants: 7. Length: 4h/day/3 days OR a 6 hour master class.